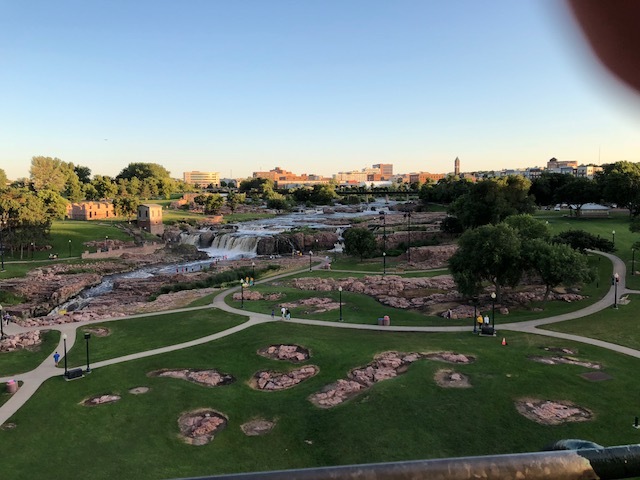 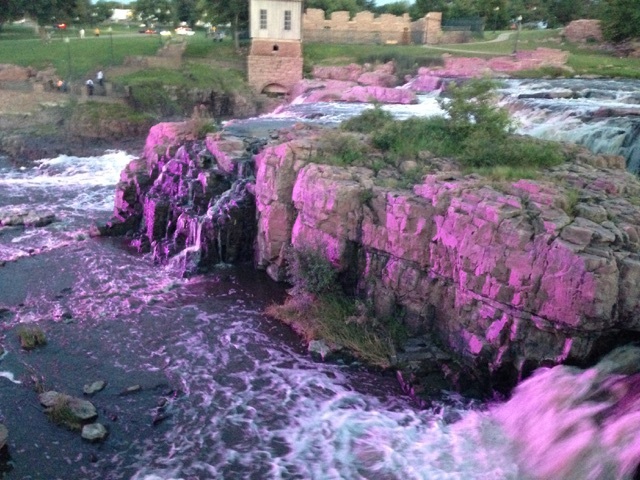 The falls were lit purple in honor of the Catholic daughters at the direction of the mayor. 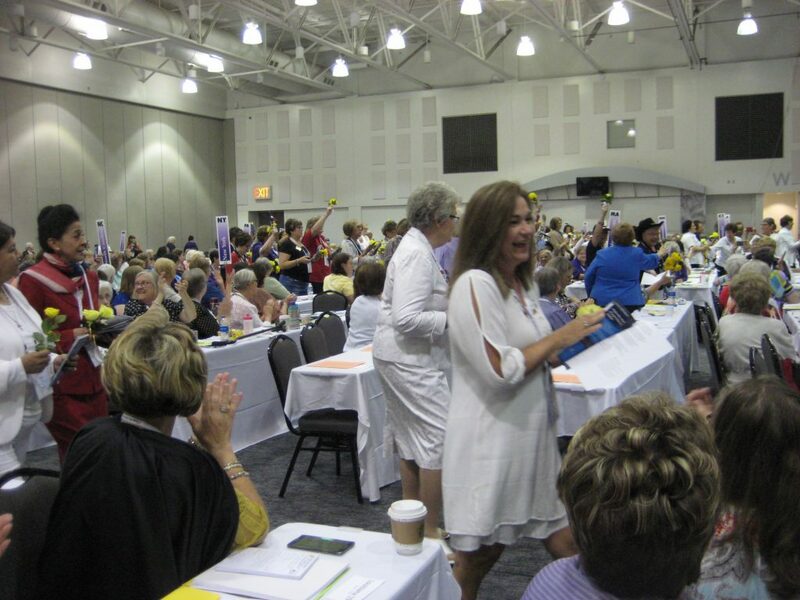 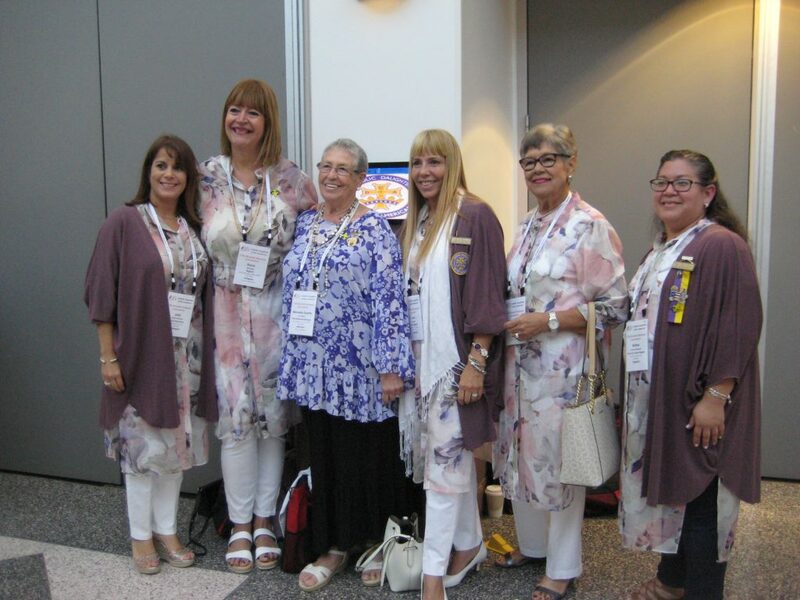 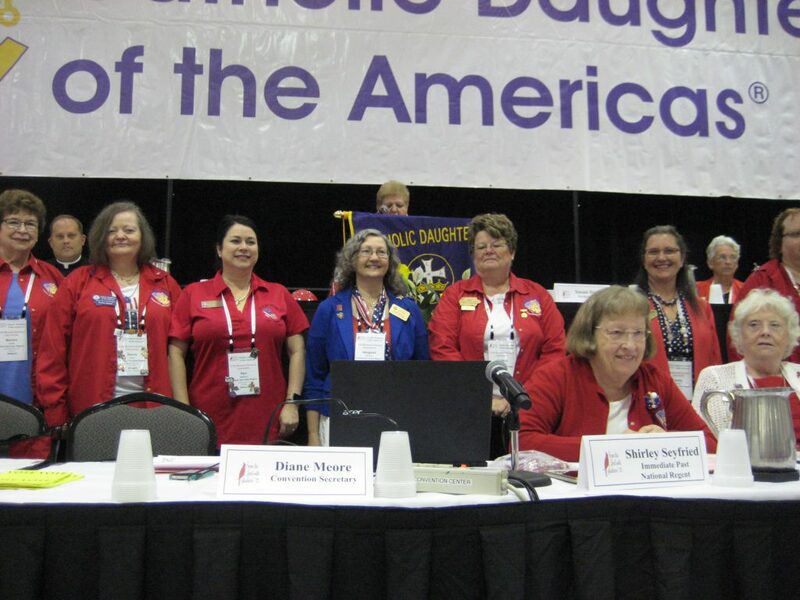 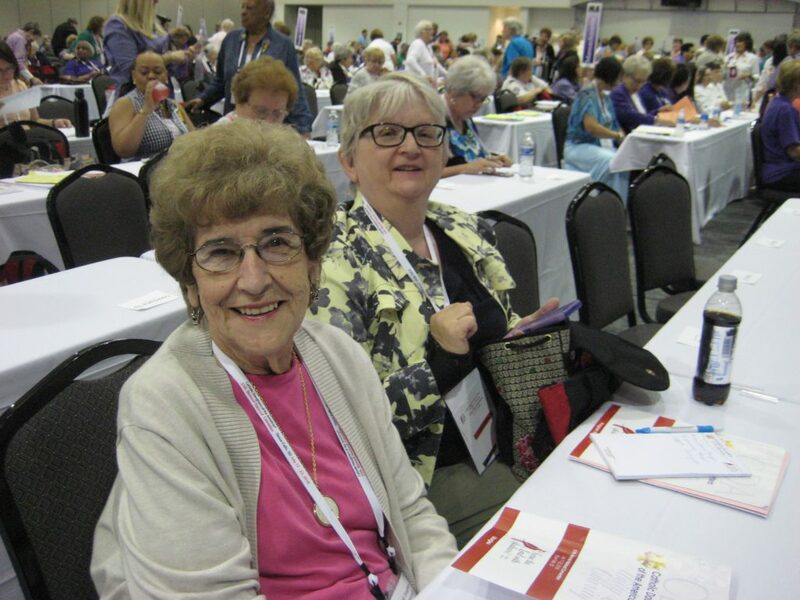 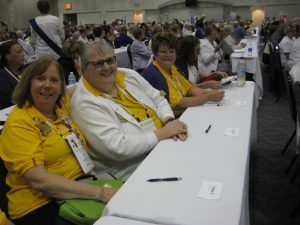 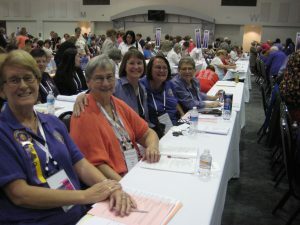 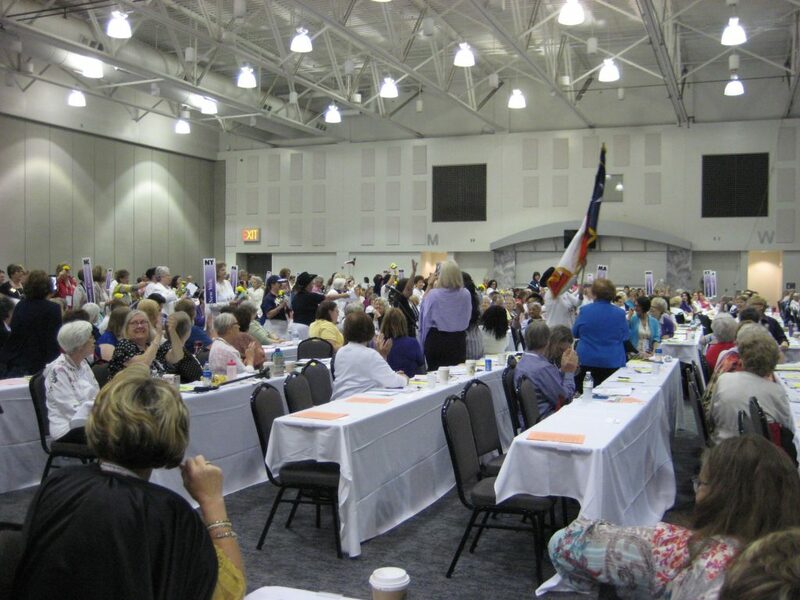 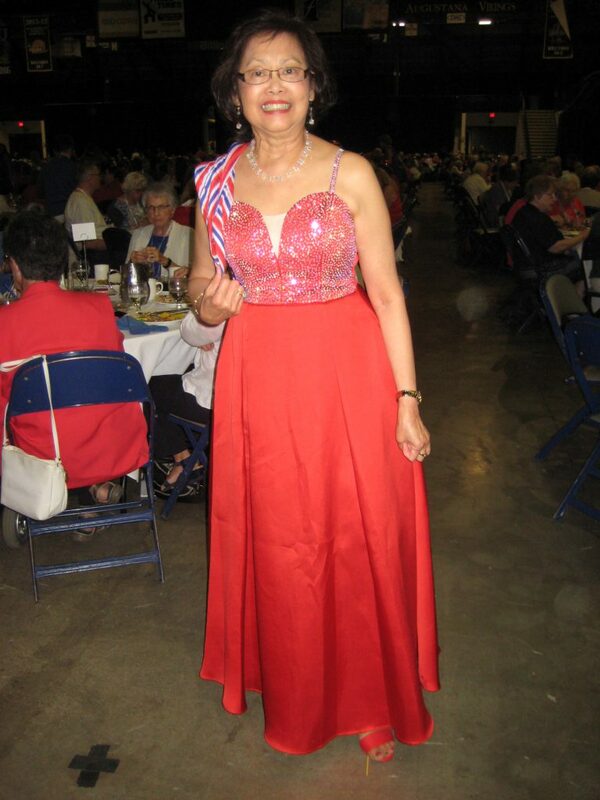 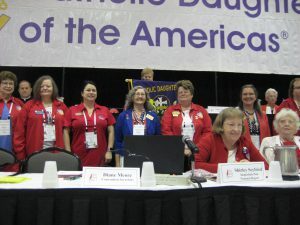 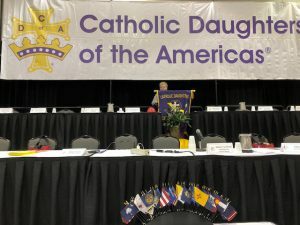 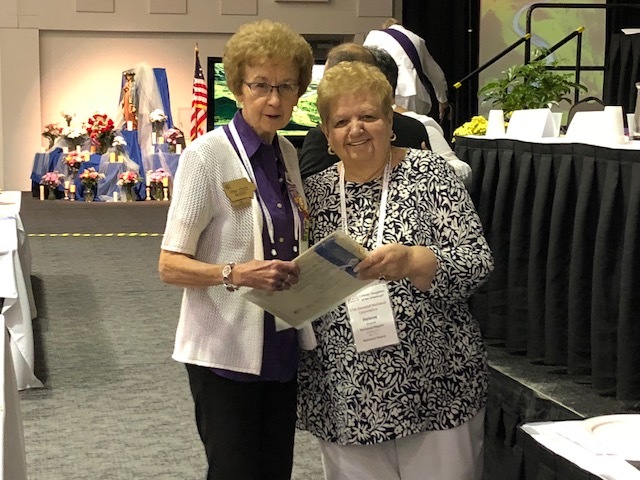 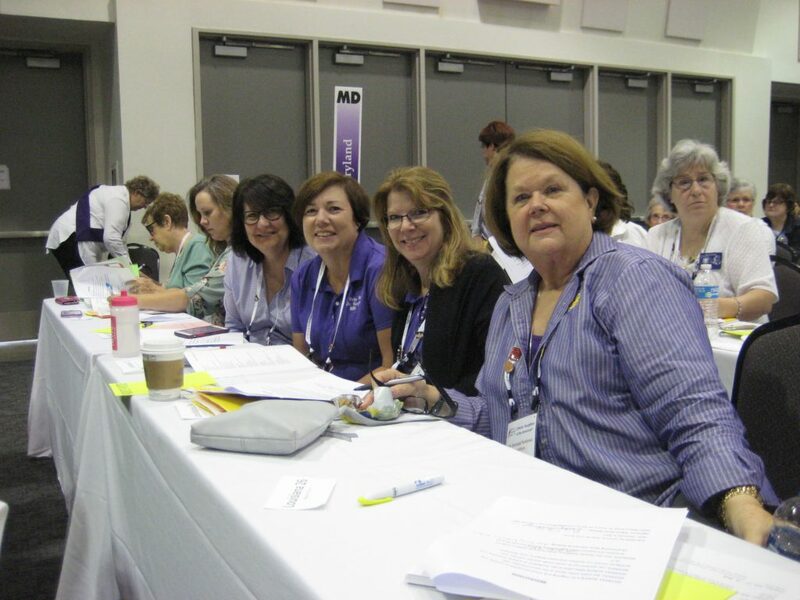 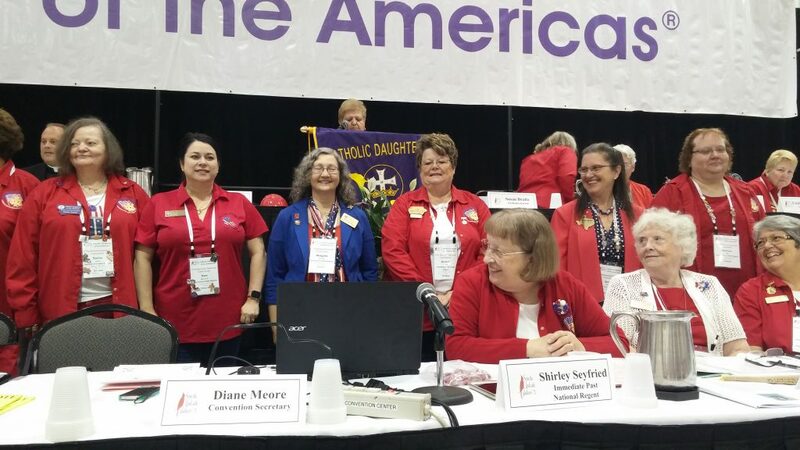 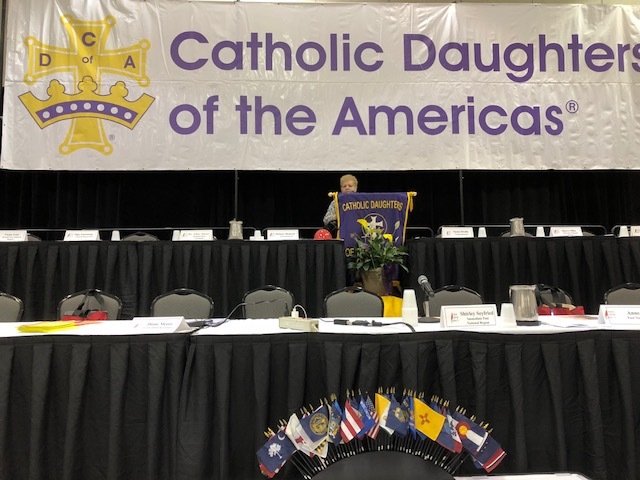 Darlene Moritz, Immediate Past State Regent is elected to the 2020 National Nomination Committee. 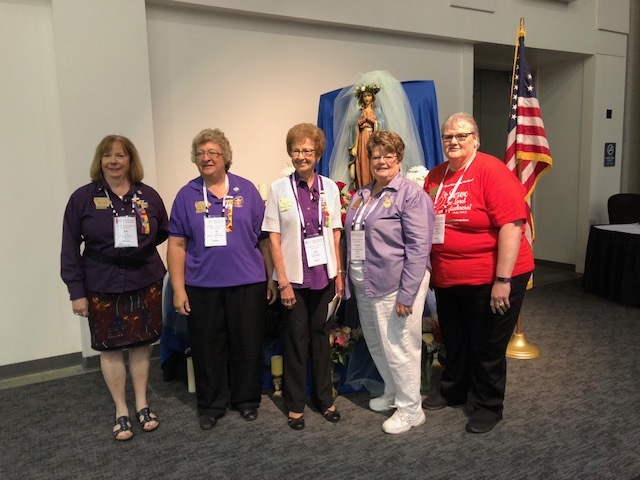 Current Iowa state officers with Immediate Past State Regent. 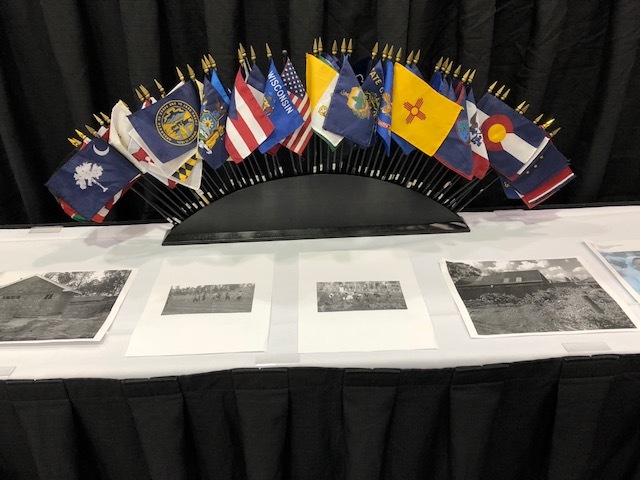 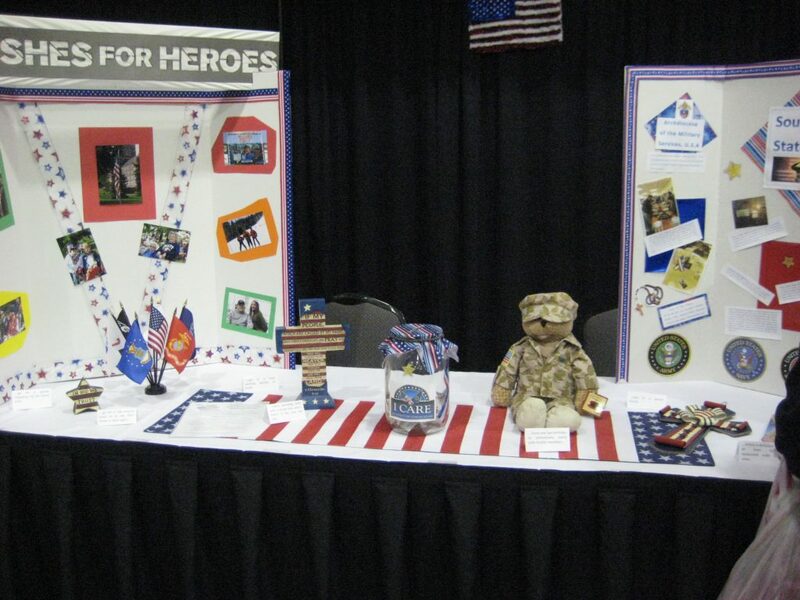 State and country flags brought in at the beginning of the convention. 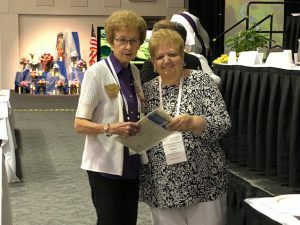 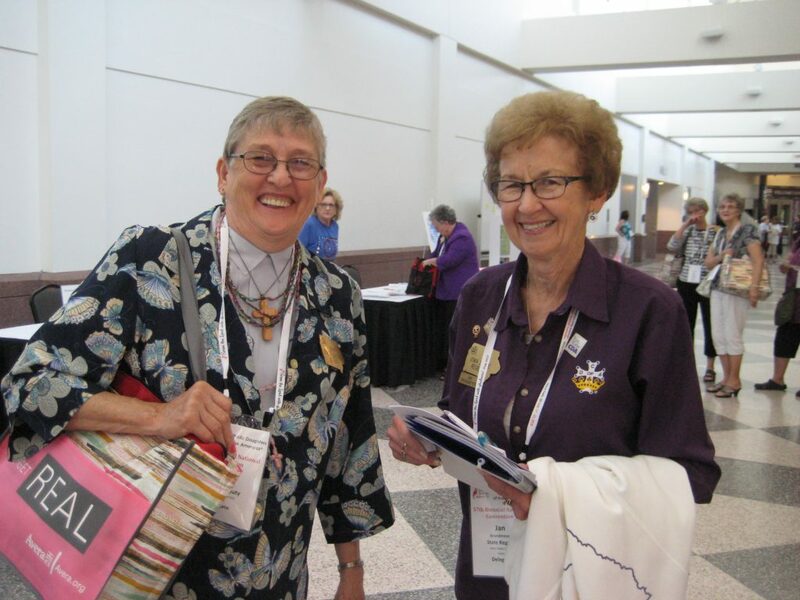 State Regent Jan G. receives awards from National Regent Helene Shepard. 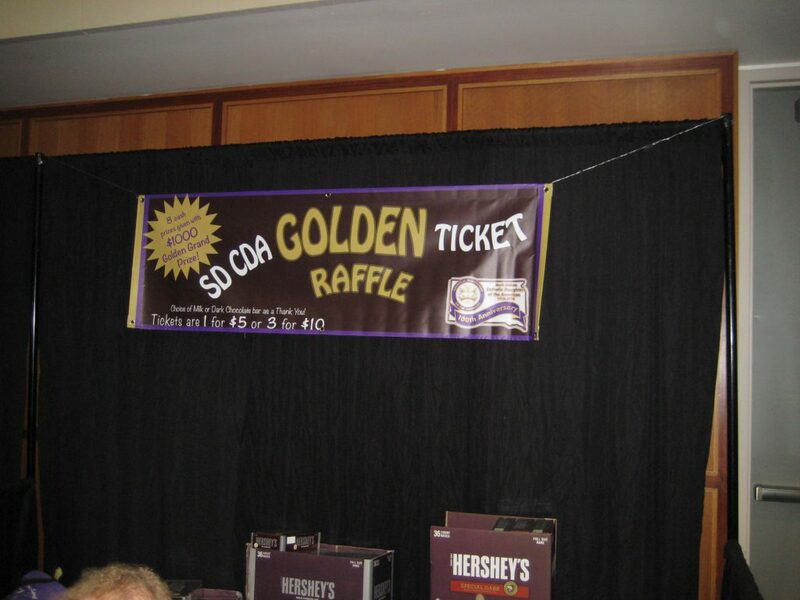 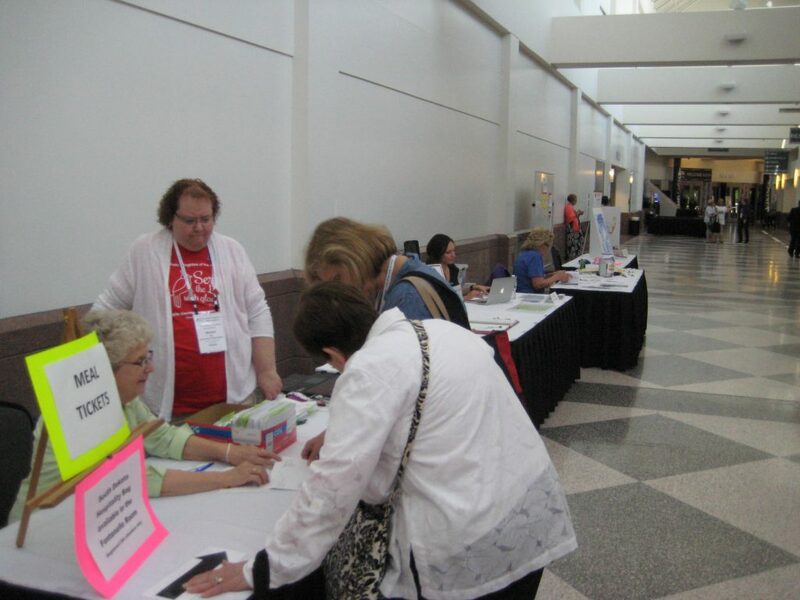 pickup your meal tickets after registration. Regals from Texas – Wearing red to support our military. 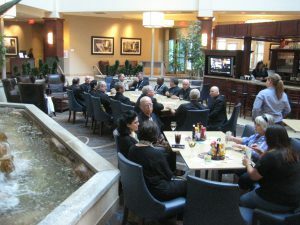 The clergy needed some refreshments too! 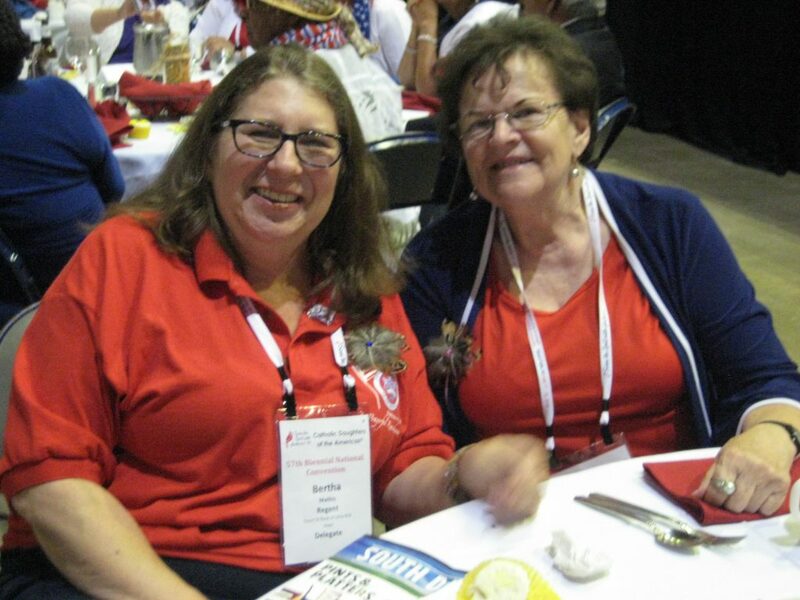 RED Friday at the Convention Most CDA members at the Convention wore red on Friday to ‘Remember Everyone Deployed.’ It is to remind people of our heroes overseas and to show that we are thinking of them. 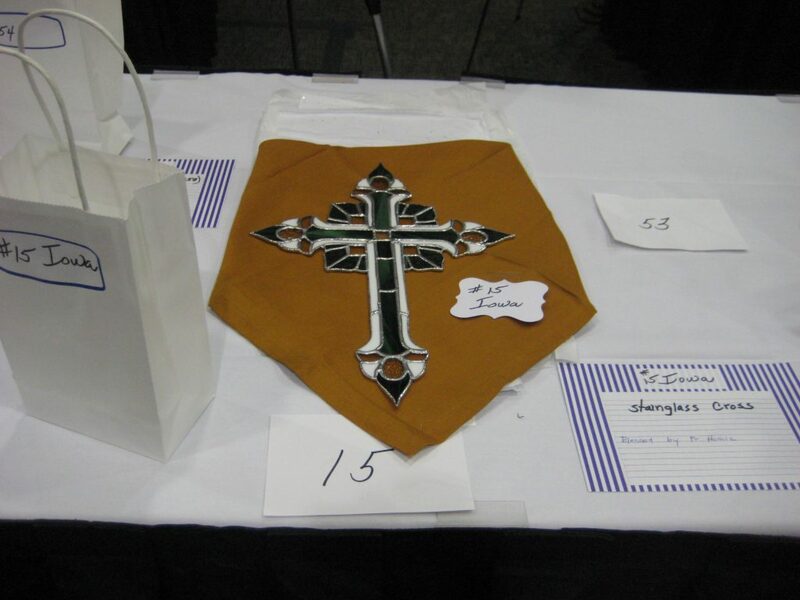 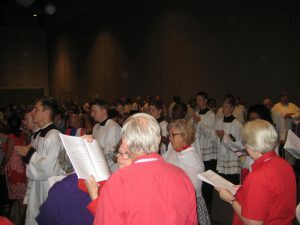 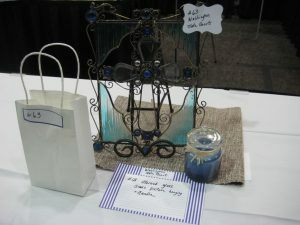 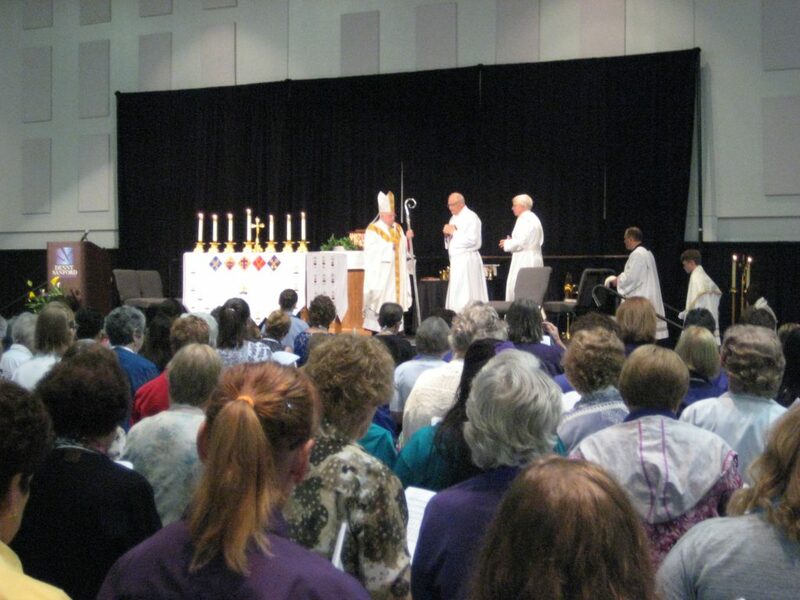 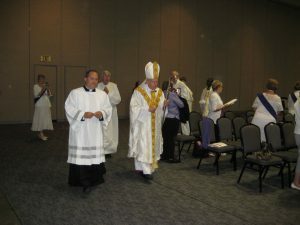 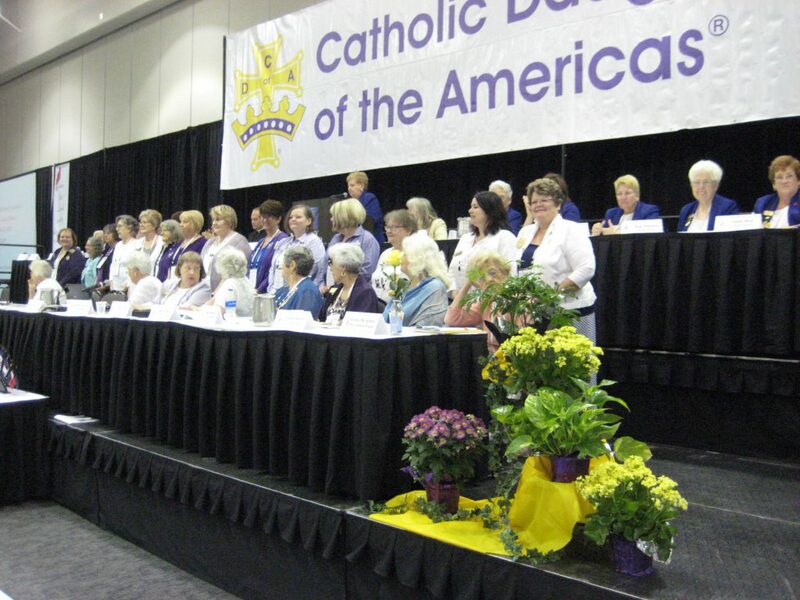 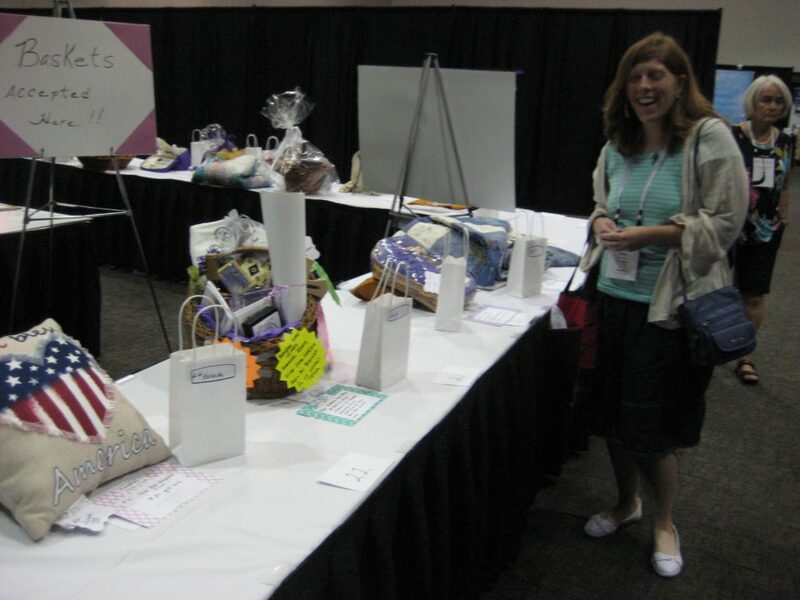 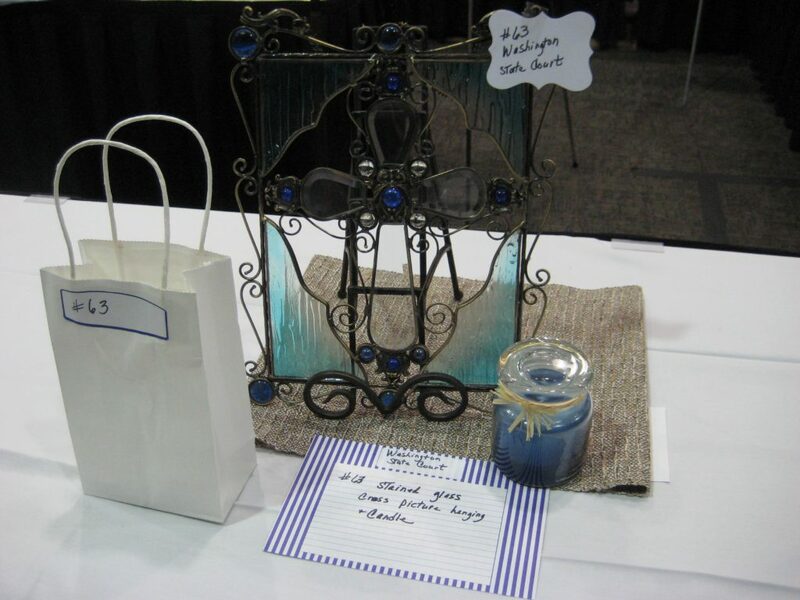 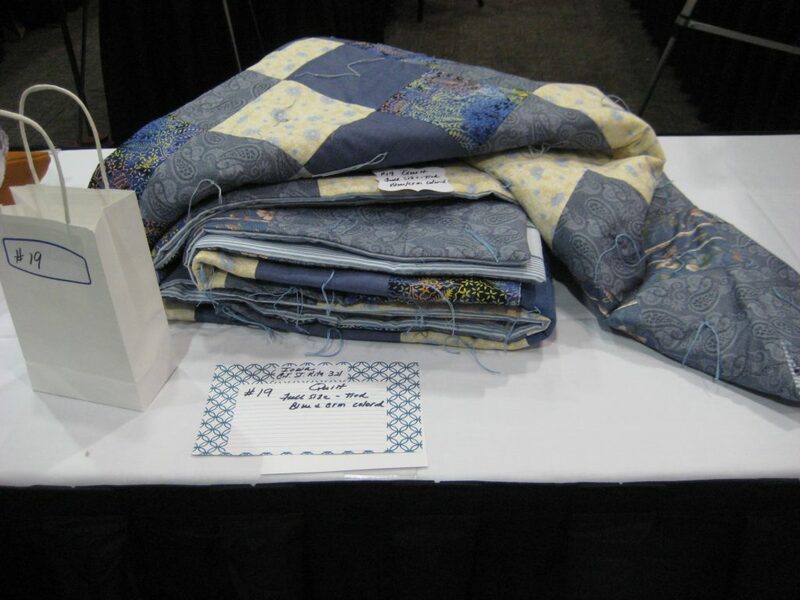 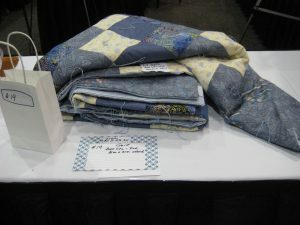 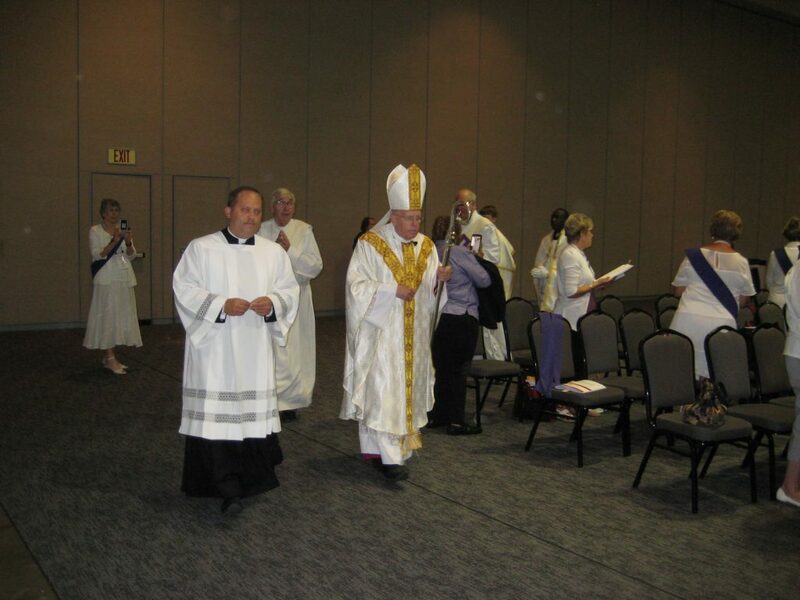 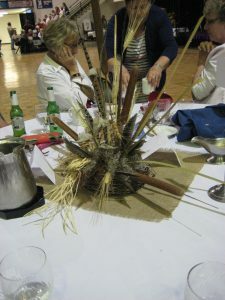 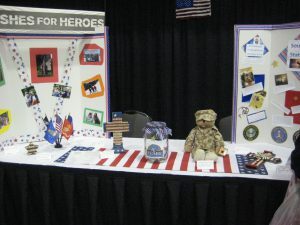 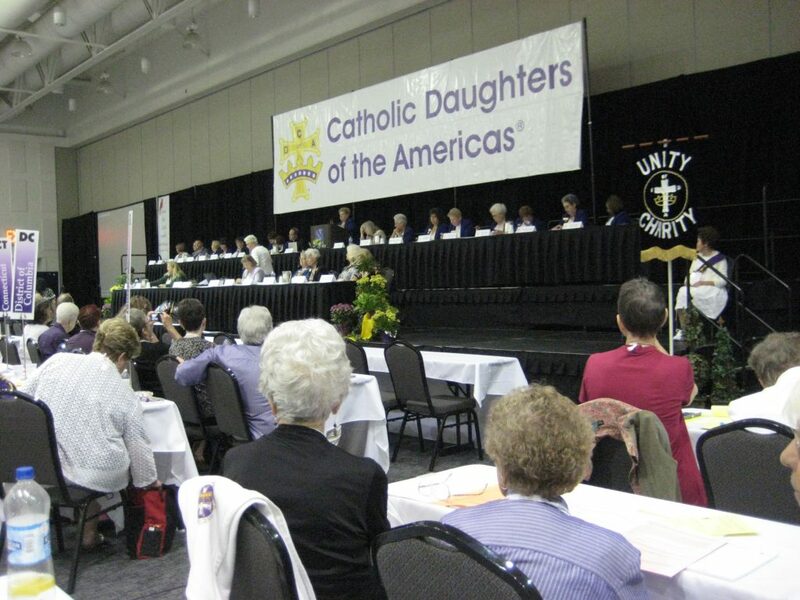 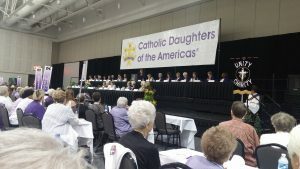 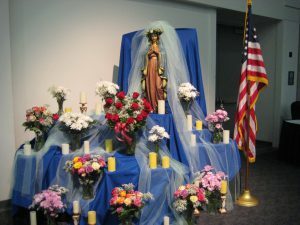 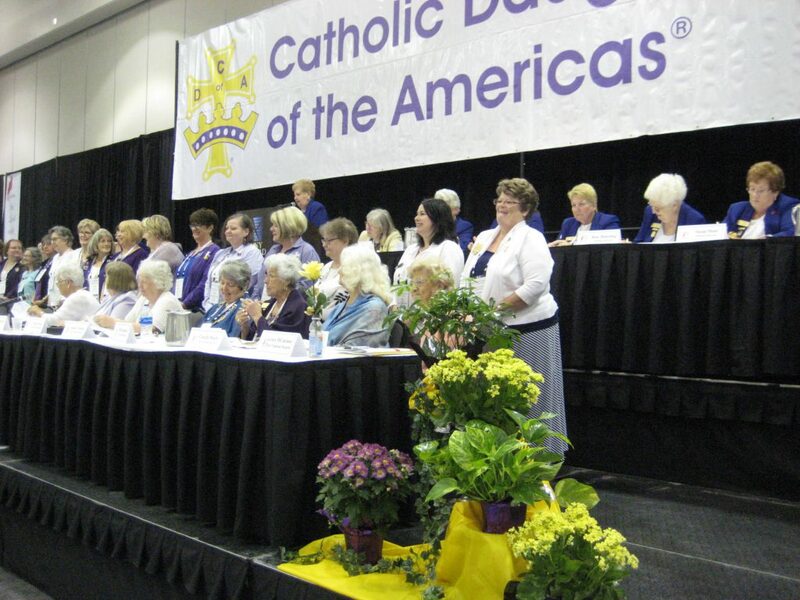 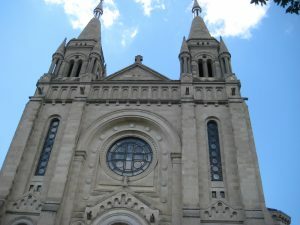 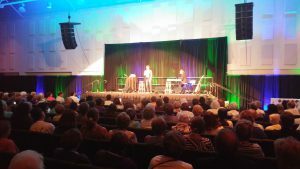 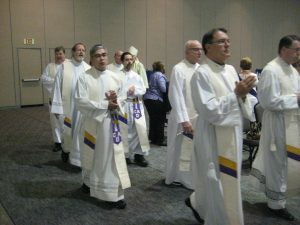 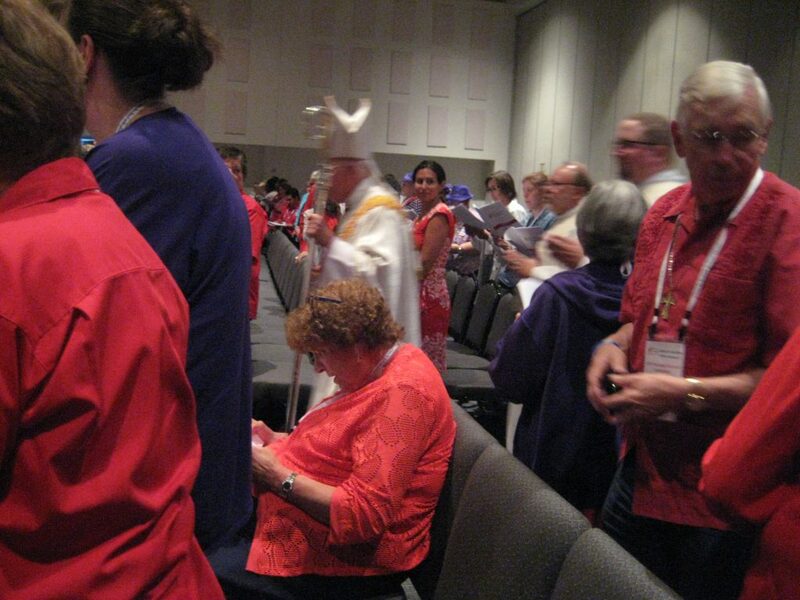 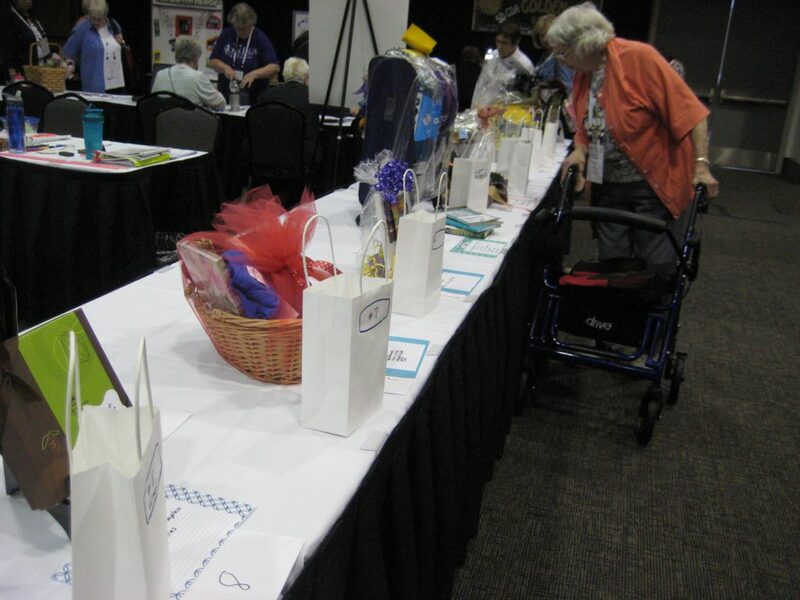 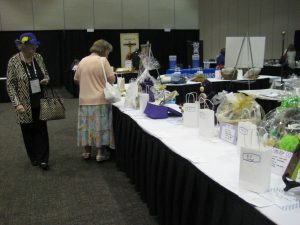 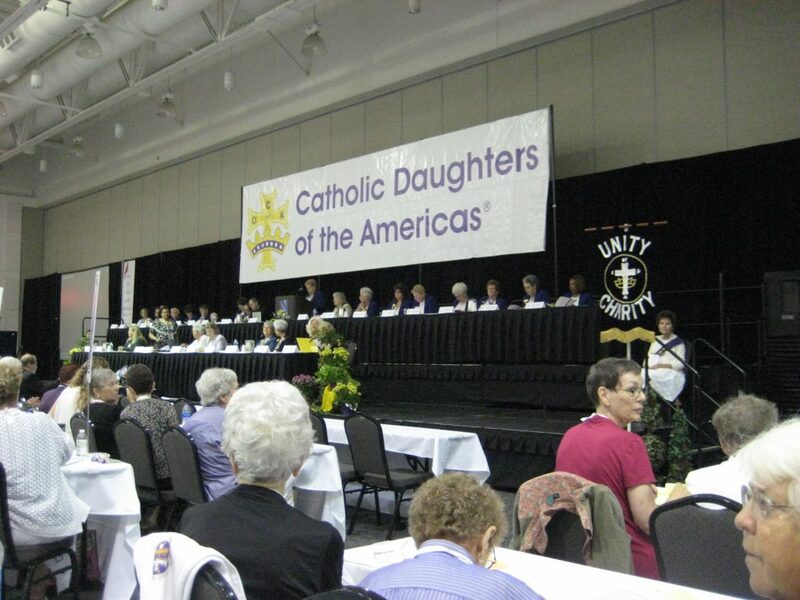 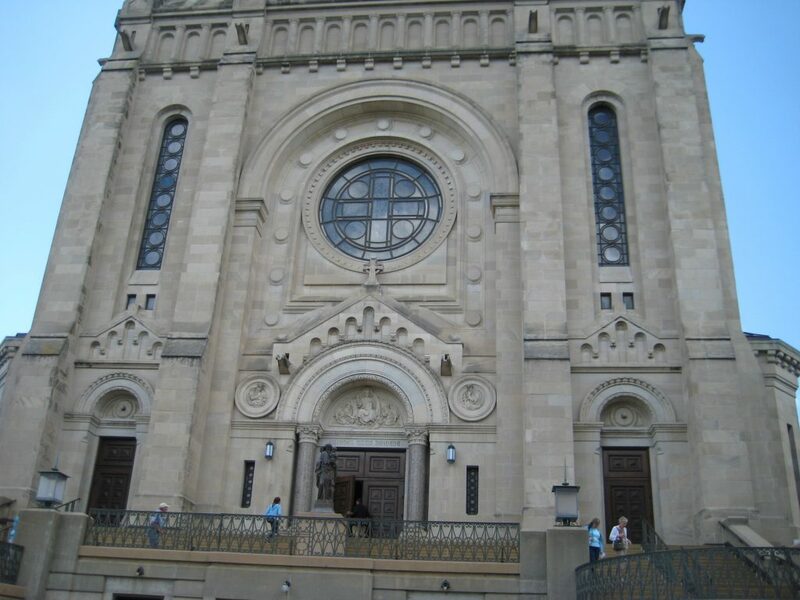 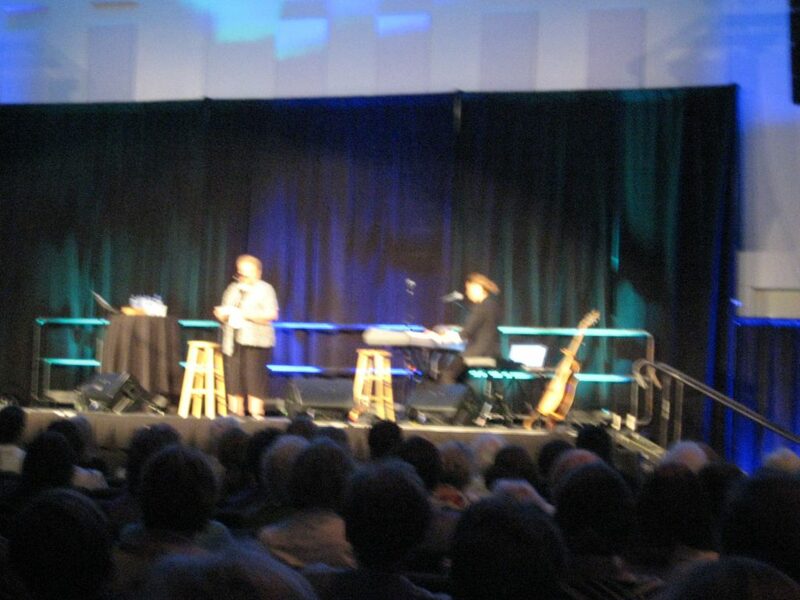 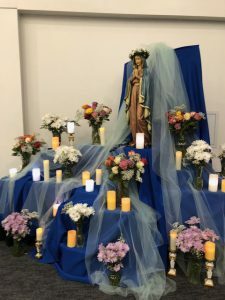 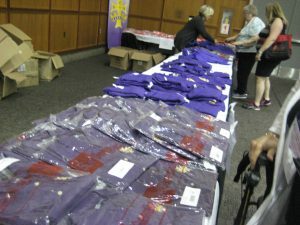 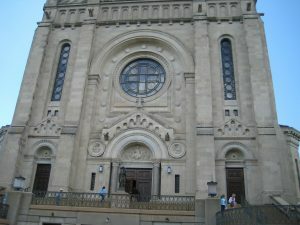 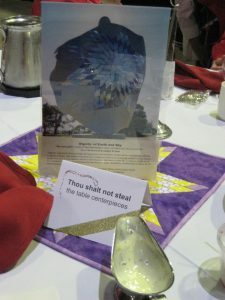 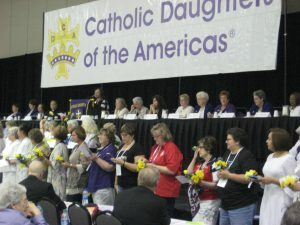 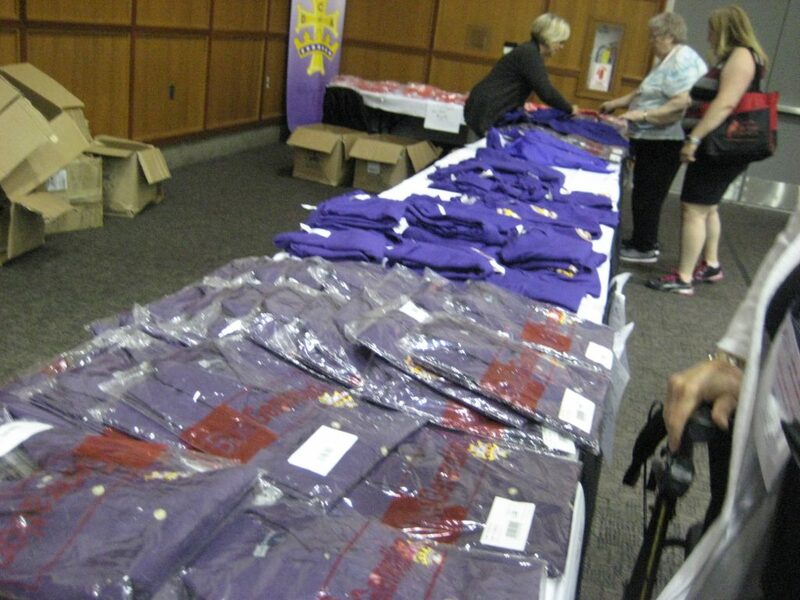 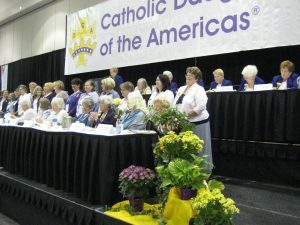 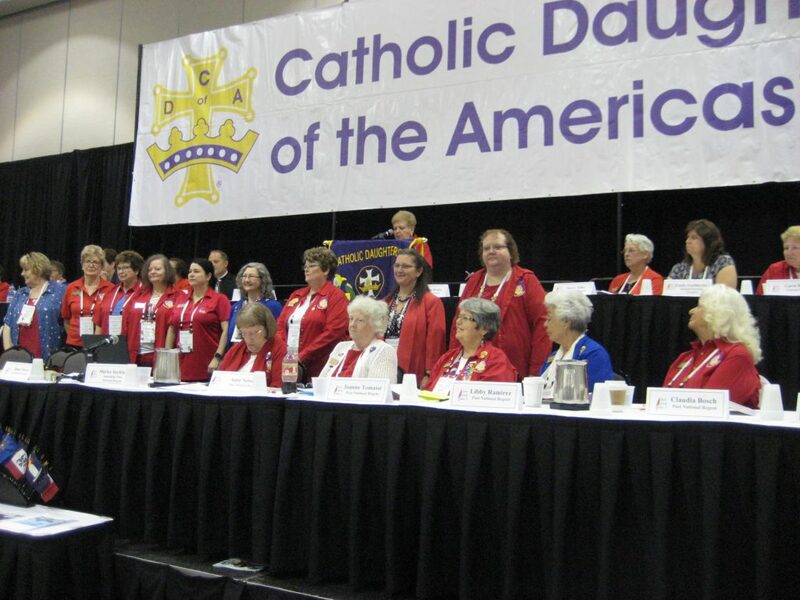 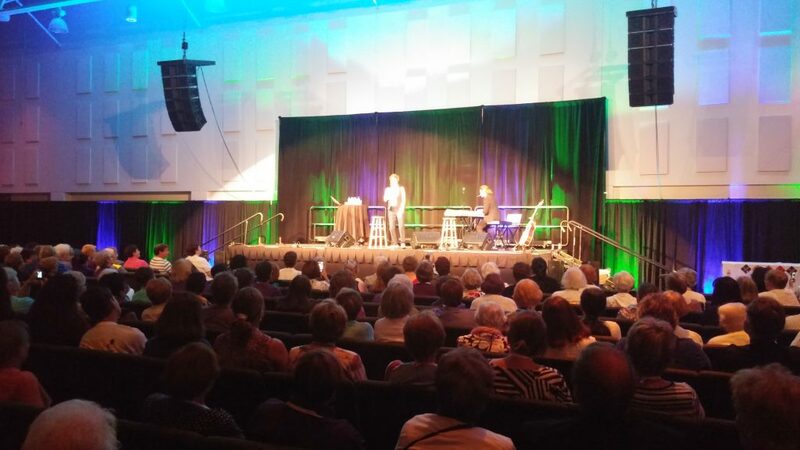 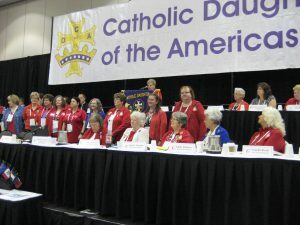 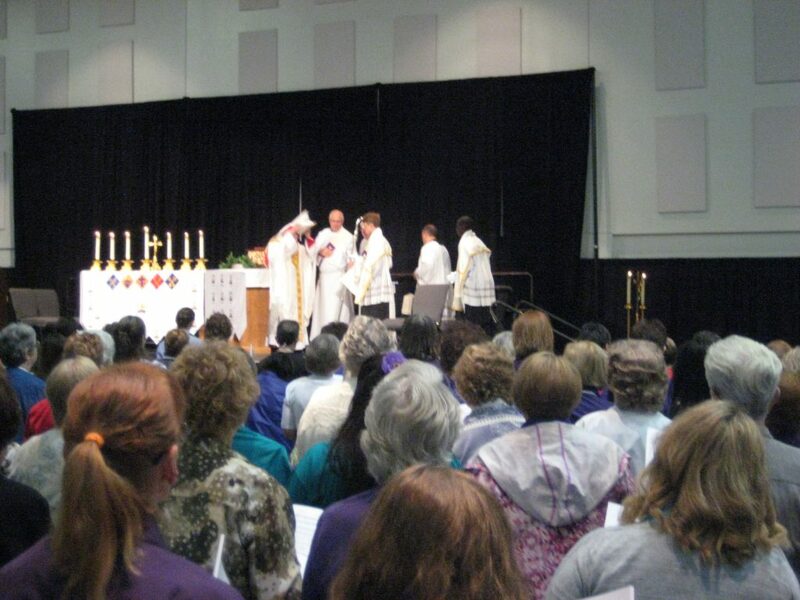 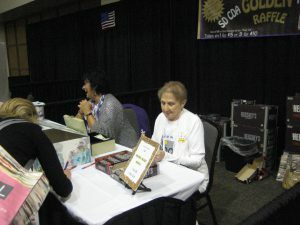 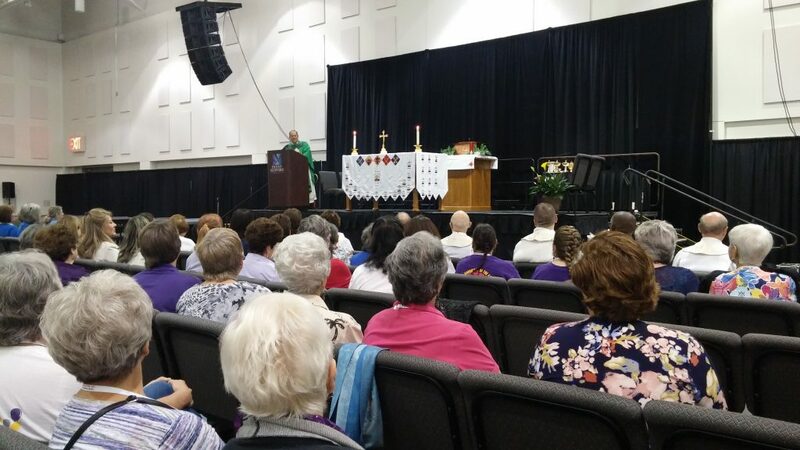 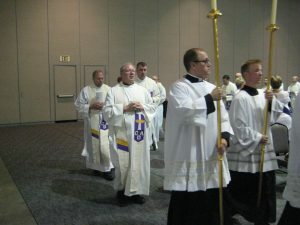 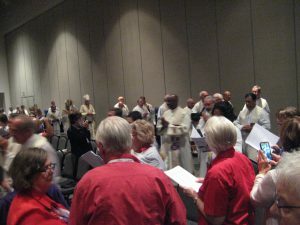 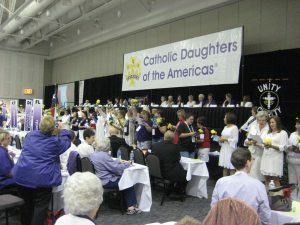 A Memorial Mass was said that day at the Convention. 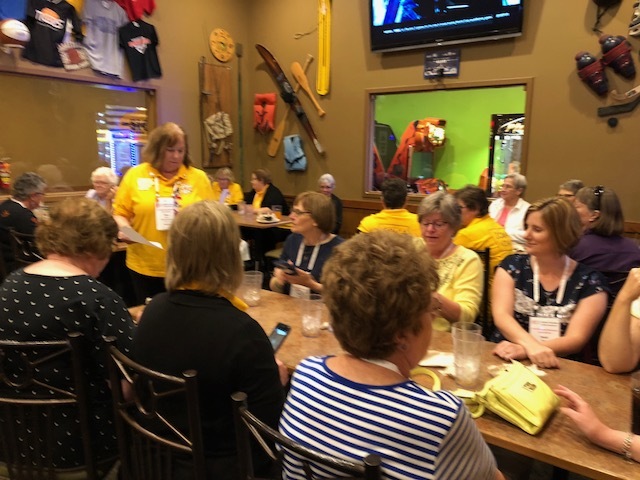 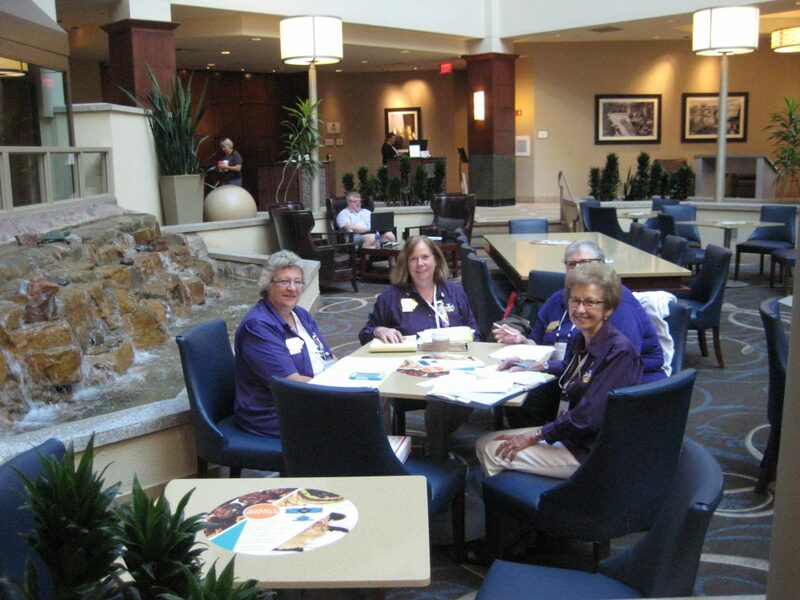 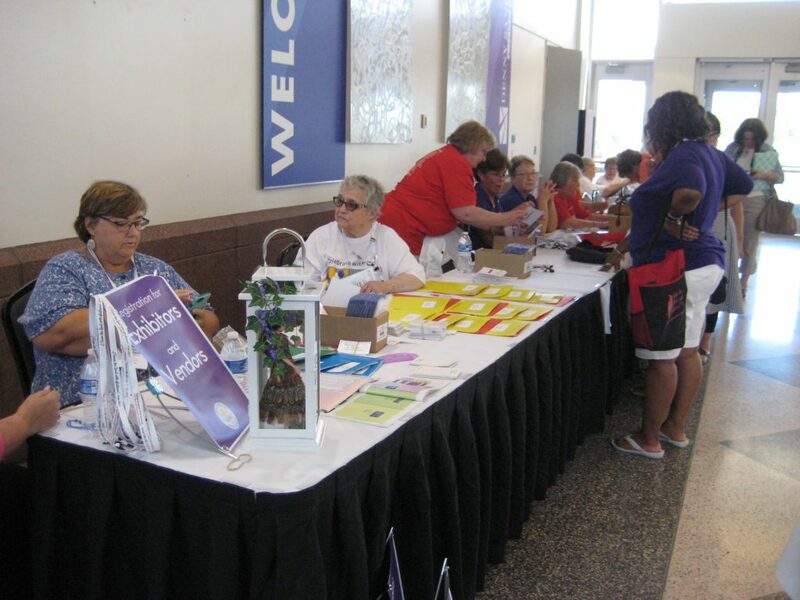 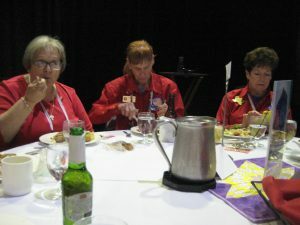 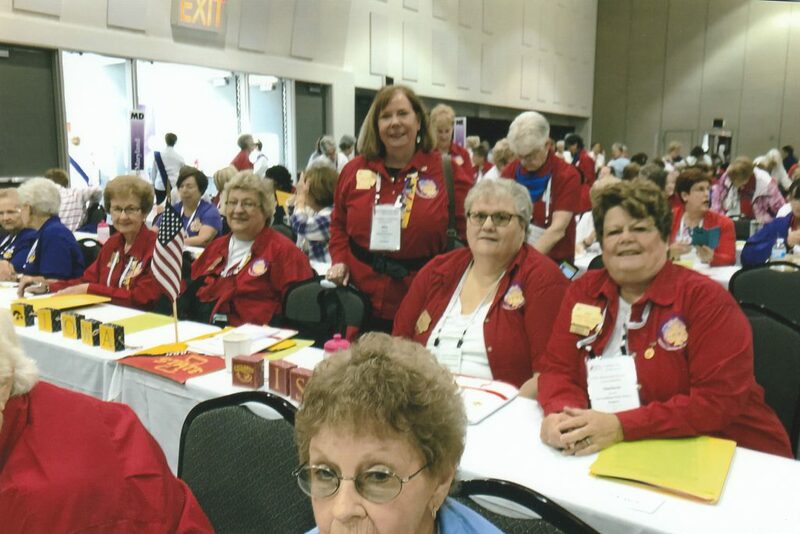 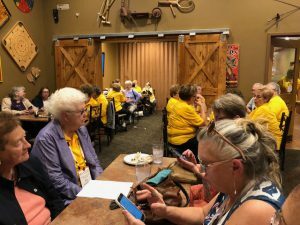 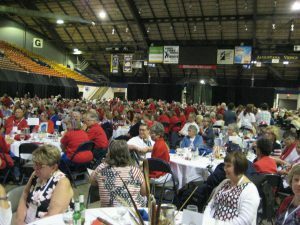 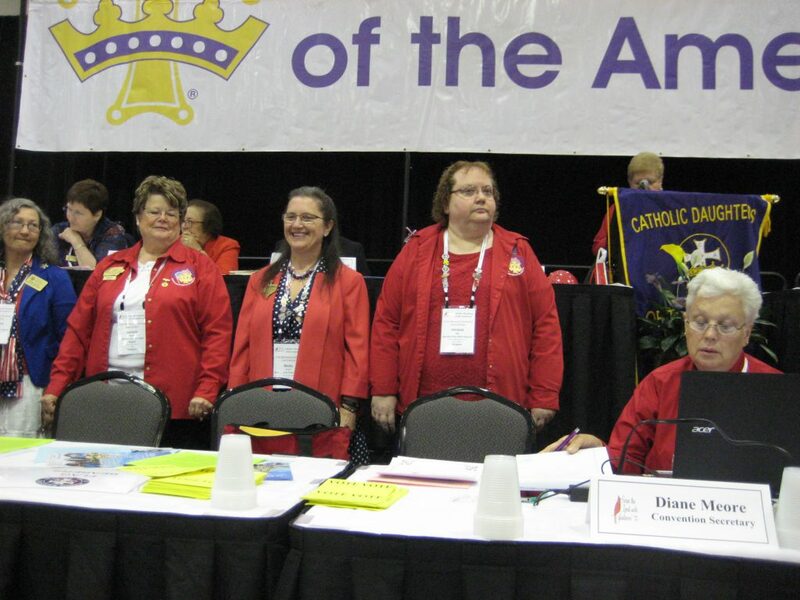 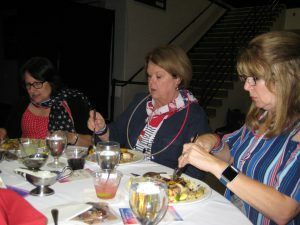 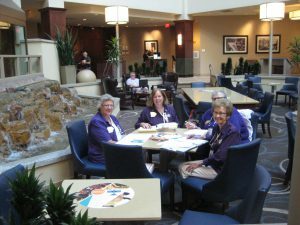 Pictured left to right in red: Iowa State Regent Jan Grundmeyer, 1st Vice Iowa State Regent Karen Kasparbauer, Iowa State Secretary Rita Carlson,Iowa State Treasurer Deb Steger, and Immediate Past Iowa State Regent Darlene Moritz. 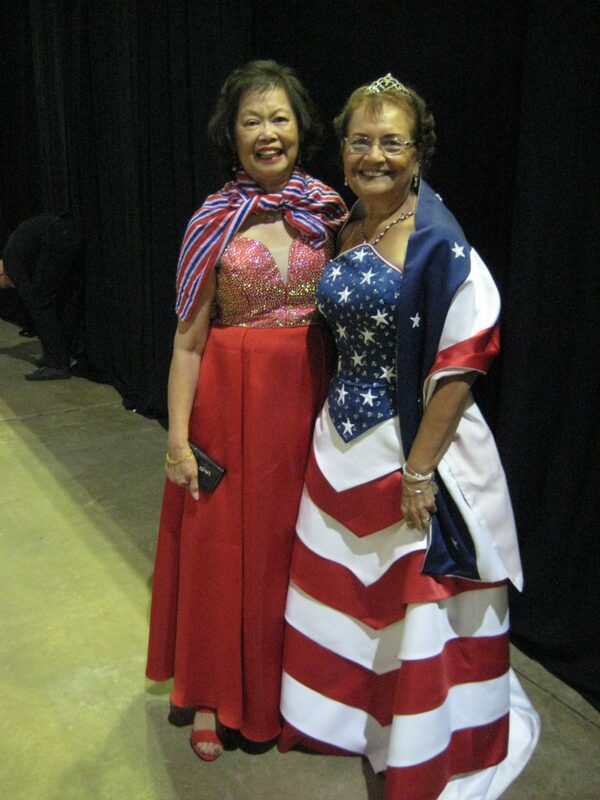 (Lady in front not identified). 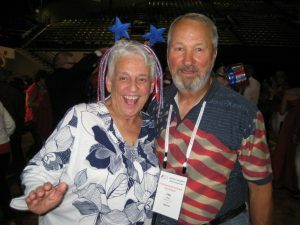 National Regent Elect Sherry Nilles with her husband Lee, cutting a rug at the Fun Night Dance! 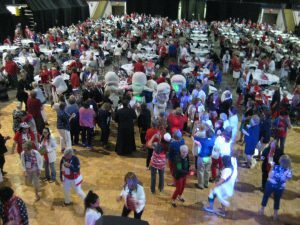 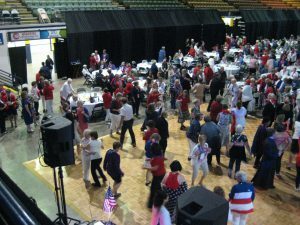 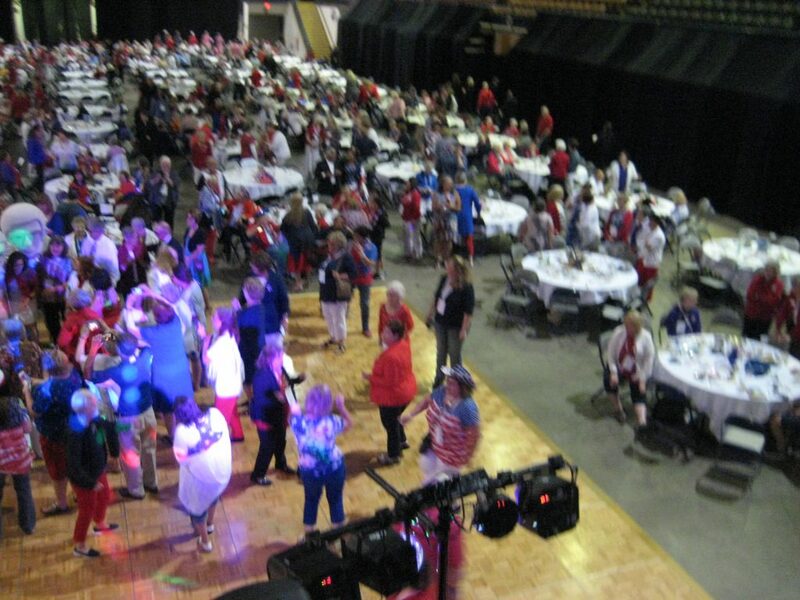 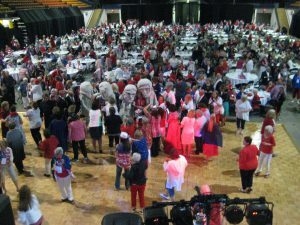 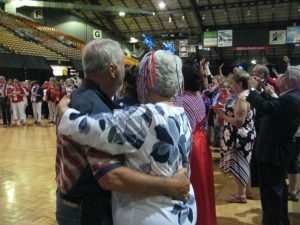 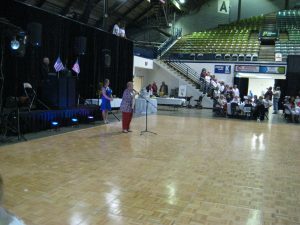 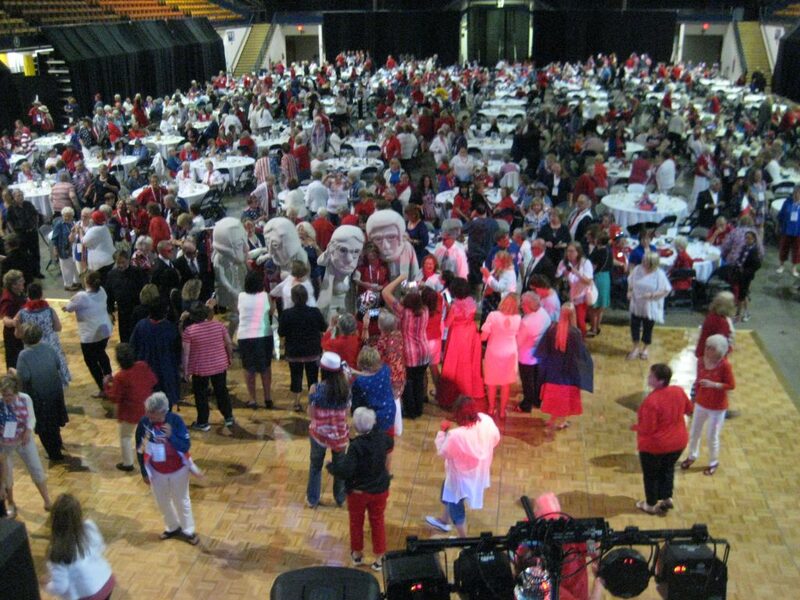 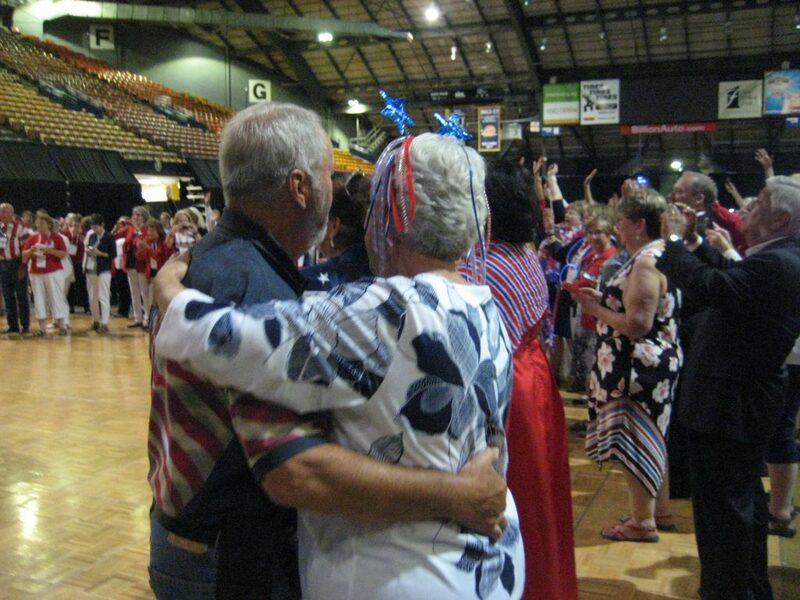 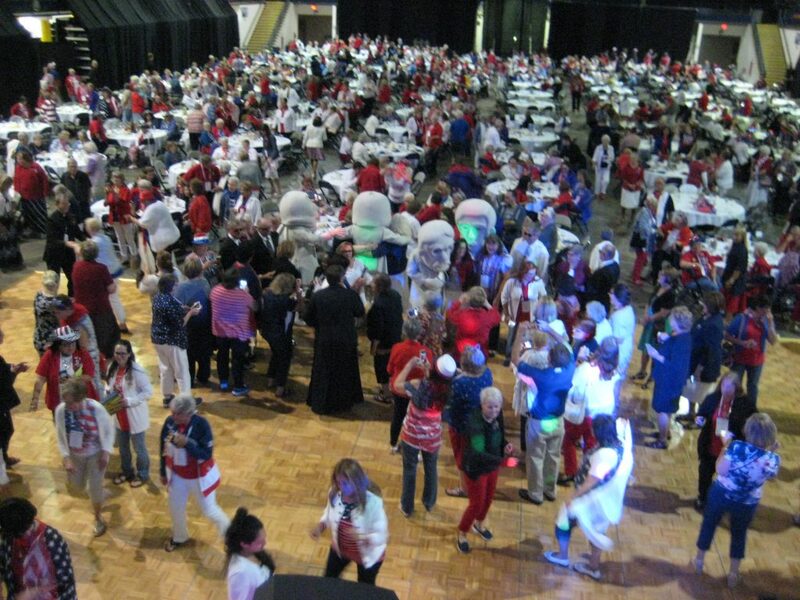 Friday night Fun Night was held on the area floor, plenty of room for dinner and dancing! 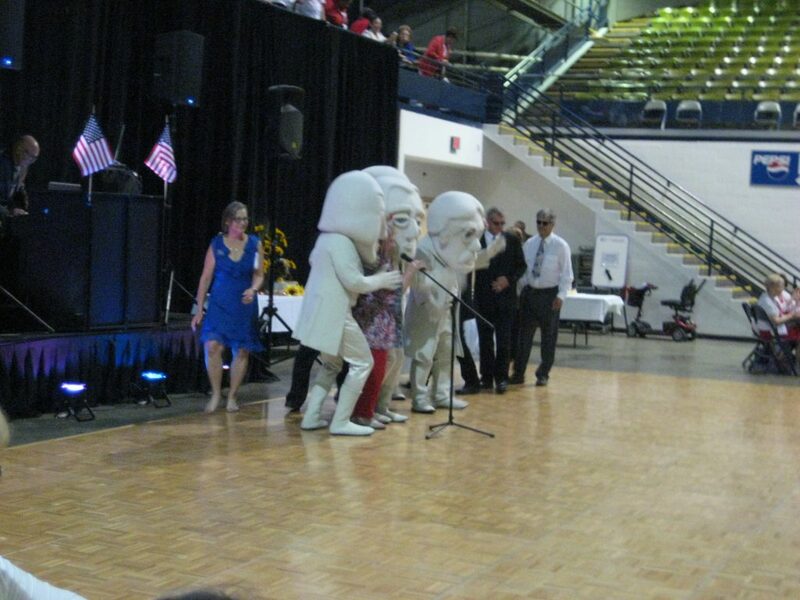 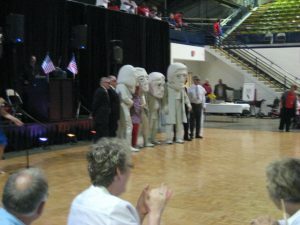 The Rushmore Presidents showed up for dancing and photo ops.